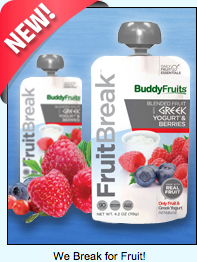 BuddyFruits FruitBreak Blended Fruit with Greek Yogurt - Grab & go deliciousness, coming right up! These all-natural pouches are like grown-up versions of those kid-centric yogurt tubes, with Greek yogurt and fruit. Perfect. In Yogurt & Berries and Yogurt & Peach & Banana, each 4.2-oz. pouch has 90 - 100 calories, 2 - 2.5g fat, 10mg sodium, 16 - 19g carbs, 2g fiber, 13 - 17g sugars, and 2g protein (PointsPlus® value 2 - 3*). Click to find it, or order online . Now Trending: New Food Finds Worth Ordering Online (HG Lisa's Must-Click Picks)! We've updated our Shop It! page with even more great stuff worth ordering via Amazon. Here's a preview of the new class... Visit our Shop It! page for the full (and fully delicious) 411! Phoney Baloney The Original Coconut Bacon: Looking for veggie-friendly bacon bits that aren't Bac~Os? These are all-natural and way yummy... and the stats are super impressive! GimMe Organic Roasted Seaweed Snacks Crumbles: You have to try these crumbled, seasoned seaweed snacks... No excuses! The light sesame flavor is just right, and the crispy texture is amazing! FlapJacked Protein Pancake Mix: Protein-pumped whole-grain pancakes? Yup! The Banana Hazelnut flavor is not to be missed. Click here to visit our Shop It! page for more info... Then order up! Ahhh! New book alert! The Hungry Girl Diet Cookbook: Healthy Recipes for Mix-n-Match Meals & Snacks hits shelves next Tuesday! That means this is the last week to take advantage of our incredible preorder promo and score a bunch of free loot. Click for details, and get your order in ASAP. In more book news, the Hungry Girl Super-Fun Night book tour kicks off next week with events in Philadelphia, New Jersey, and Minneapolis! Click for more info. ***If there's a Noodles & Company near you, you may want to shimmy over there and try out the new BUFF Bowls -- they're noodle-less! The bowls feature spinach in place of noodles, twice the veggies, and either meat or tofu. There's even an option to increase the protein for an extra two bucks. Impressive… ***On the topic of good-for-you eats, adding ginger to your food may help promote weight loss. Click here for more info from our pals and partners at About.com Health. Then cook up a batch of this ginger-spiked soup. ***Lastly, McDonald's is stepping up its game with preservative-free artisan grilled chicken. Try it on the Premium Southwest Salad with Grilled Chicken (340 cals, 11g fat, PointsPlus® value 8*) or the Artisan Grilled Chicken Sandwich (360 cals, 6g fat, PointsPlus® value 9*). Nice going, Ronald! And that's all we've got. 'Til next time… Chew the right thing! Go halvsies on your Shop It! order with a buddy... Click "Send to a Friend" now. Today, April 20th, is National Pineapple Upside-Down Cake Day. And it just so happens that our Upside-Down Pineapple-Applesauce Cake is amazing.